The Children’s Health Insurance Program (CHIP) provides health insurance coverage for over 9 million low income children and pregnant women. CHIP is a success story and has enjoyed 20 years of broad bipartisan support. Unfortunately, federal funding for CHIP will formally expire at the end of September 2017. 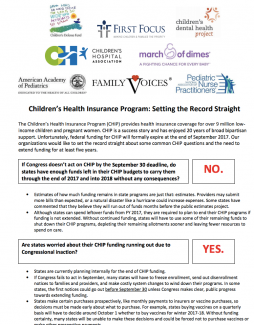 First Focus joined eight of the largest children’s organizations in the country to set the record straight about some common CHIP questions and the need to extend funding for at least five years. Groups include: American Academy of Pediatrics, Children’s Defense Fund, Children’s Dental Health Project, Children’s Hospital Association, Family Voices, First Focus, March of Dimes, and the National Association of Pediatric Nurse Practitioners.